Ramadan is here, the a holy month where Muslims observe fasting and count their blessings for being fortunate, it is also a time when Malay families prepare for Hari Raya. As you cook up a storm during this festive period and invite your friends and loved ones to break fast together, Dettol and Air Wick ensure you stay germ-free and protected with a great-smelling home to impress your guests! At the same time, did you know, throughout May and June 2017, all you have to do is spend RM25 and above on Dettol and/or Air Wick products in a single receipt, and redeem an exclusive Raya cookie container to store all your favourite nibbles in. There are four attractive colours of the Raya cookie containers to add joy to your home and they are available at major pharmacies, supermarkets and hypermarkets in Malaysia. 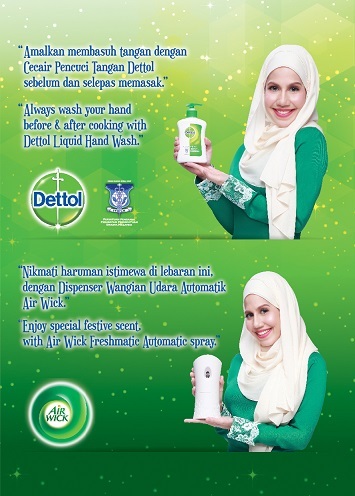 Chef Anis Nabilah also expressed her excitement for this year’s Hari Raya celebrations together with Dettol and Air Wick. Dettol and Airwick wish all Raya celebrants a peaceful and blessed Ramadan with Dettol’s germ-free protection and Airwick’s scent for the home. For more information on the campaign, head over to Dettol Malaysia Facebook.